Did you get an invitation in your email? 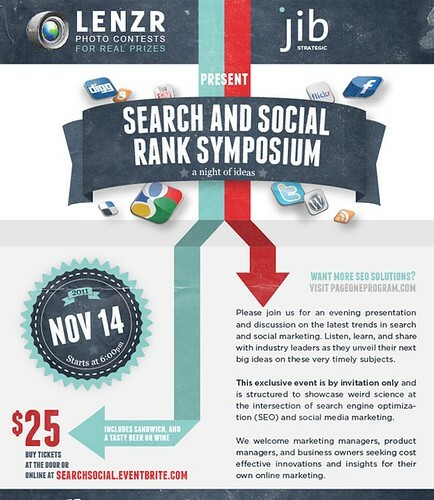 There’s something happening in The Cannery Room down in The Distillery District, 55 Mill St Toronto on Monday Nov 14th 2011, and we’re calling it the Search and Social Rank Symposium. What is a Symposium anyway? 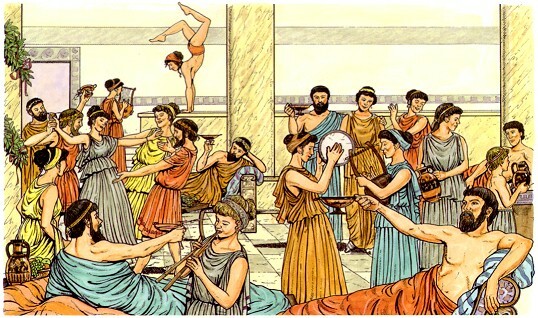 In ancient Greece, a symposium was the name for a wine soaked gathering of male guests; it was a meeting between men of good families. They were held frequently and were important for fostering debate and building consensus and transmitting ideas. Sometimes there were women involved, as seen above, and music and dancing, but more often there was a lively group discussion (and poetry) between men. Symposia were held by common people too , and aristocrats to celebrate special occasions, such as victories in arts and athletic contests. The most famous symposium of all, described in Plato’s dialogue, was hosted by the poet Agathon on the occasion of his first victory at the theater contest of the 416 BC Dionysia. According to Plato, the celebration was upstaged by the unexpected entrance of the toast of the town, the young Alcibiades, who arrived drunk and nearly naked, having just left another symposium. The participants, or “symposiasts,” were limited, and depending on the host, they were handpicked and individually invited to the assembly. The gatherings only held a dozen or more people who enjoyed food and wine and listened to each others’ stories and schemes – they made their own entertainment in a night of ideas. Lenzr Corp is inviting the men and women of good families to come and glimpse small but brilliant steps forward into the grey shadowy mists of internet web marketing. David Shephard and Rob Campbell will open things up with a conversation about Lenzr and Miss Teen Canada World, followed by Ameet Wadhwani and ‘Pulse’ and then some surprises – we might see Jade Hirtle from Social Scratch, or Michael Nus and Chris Brooker from Epilogger, and more. This will be a symposium of substance, a night of delicious ideas. This entry was posted in optimization, search, Seminars and workshops, tips and tagged Agathon, Alcibiades, Ameet Wadhwani, Chris Brooker, David Shephard, Epilogger, Jade Hirtle, Jib, Lenzr, Michael Nus, Plato, Rob Campbell, Search and Social Rank, Symposium. Bookmark the permalink.